Mother of two Lynsey Bellingham shares her insight into how she combines her love of country pursuits with family life. From tips on the best equipment and clothing to invest in, as well as how to make a hunting day accessible for youngsters, this article will help you inspire your children to love hunting. 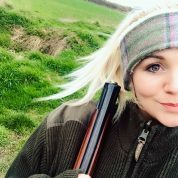 An outdoors blogger from the Shropshire countryside who writes about field sports, as well as equestrian and country living. Raising two boys I’ve found no better classroom than the great outdoors. Practical family trips hunting and shooting have been solid foundations for my children enjoying and respecting the countryside. Survival of our sports depend on educating the next generation so let’s not shy away from it. I adore seeing children embracing country pursuits. When we are out in the field as a family (whether it’s ferreting, beating or fishing) the most important things are to stay safe and have fun, falling in love with everything rural. Education surrounding safety is the always a top priority before we head out anywhere. It’s handy to have a family pep talk of dos and don’ts making sure everyone is clear on why we must practise safe conduct around firearms, wildlife and the countryside. Setting positive, structured guidelines encourages everybody to stay safe in the field plus it re-enforces confidence and responsibility to take direction that only continues to flourish with an unambiguous attitude to safety. A day with family doesn’t even have to have a huge bag to be considered successful. I wouldn’t put an unrealistic expectation on the day. Simply aim for everyone coming away with a smile and positive experience. Sometimes keeping trips nice and short is the perfect opportunity to talk through the practicalities of hunting and shooting. For example, having a go at tracking deer can be very exciting for children; let them spot tracks, ask them what kind of deer inhabits the area and teach them how to distinguish between them. In the UK introducing youngsters to ‘beating and picking up’ shows teamwork with a view of what actually goes into a shoot day. A friendly farm shoot is often informal and relaxed, a prefect introduction to the beating line. I’ve found being an open book with children when talking about hunting and shooting is so important. It’s perfectly normal to feel sad about game being shot especially for younger children but explaining why it happened along with the conservation that goes hand in hand with hunting is paramount. Let them know the positives of what happens next, for example how ‘field to fork’ brings us more in touch with our food and that having massive respect for our quarry is vital. Including children in actual hands-on tasks is where the education lies being practical is everything. Like anyone, my eldest son loves kit and having his own teaches him to look after it and respect it. Letting them put into practice what you are doing is such a powerful learning tool and doubles the enthusiasm when youngsters become part of the team. Items I include for a trip with children are a pair of sturdy child-friendly binoculars that are perfect for spotting game or birds of prey. Correct clothing as there is nothing worse than being cold and miserable, so make sure children have layers, thick socks, trusty waterproof and tough boots. Thankfully there are many wonderful brands now catering to little ones that take part in outdoor pursuits. When shooting a pair of efficient ear defenders are a must. My youngest has slept through an afternoon clay shooting none the wiser thanks to correct ear protection – though heaven forbid he should sleep in a cot next to a squeaky floorboard! A very sturdy baby carrier has been an essential and, as when going anywhere with children, don’t forget snacks! Whichever aspect of hunting you are involved in it is such a personal thing to every one of us. Children are no different. So, don’t be disheartened if they don’t immediately fall in love with country pursuits. I doubt Noah is going to follow my footsteps with the commitment to shooting immediately as becoming Batman or Minecraft hero is top of his list of things to do but giving him a foundation of love for nature and respect for conservation is a perfect platform to start and inspire him to return to if he wishes. I frequently refer back to a quote I once heard: ‘Sometimes the poorest man leaves his children the richest inheritance.’ I love this. I think it sums up what being with family in the field truly is. No matter who you are, making memories with family costs nothing and they will certainly last a life time. As always thank you so much for reading and the Monocular for featuring me. Here’s to happy hunting and happy children!